Webcam Pebble Beach, California: Pebble Beach Resorts - A view over the golf course of the Pebble Beach Resorts. Monterey, California: Harborview, 3.9 mi. Salinas, California: North Main Street, 18.3 mi. Capitola, California: Surfcam Capitola, 28 mi. Santa Cruz, California: Ocean Street, 29.4 mi. Ben Lomond, California: Landscape View, 36.2 mi. Saratoga, California: Saratoga Weathercam, 49.1 mi. Cupertino, California: Cupertino Civic Center Plaza, 52.1 mi. San Jose, California: View of the Skyline, 52.2 mi. 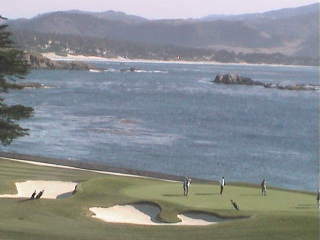 This webcam Pebble Beach, California with the theme Landscapes was added on May 31, 2010 and is operated by Pebble Beach Resorts. It got 9016 visitors since then. Shouldn't this webcam work or should the link be wrong please report that here. You can add this webcam here to myCams.